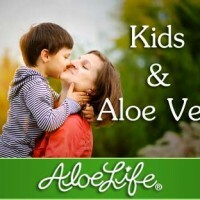 Aloe Vera is fun to use with kids because it’s gentle and it works fast! With all the scrapes, cuts, bites, sunburns and digestive upset that kids get growing up - every herbal medicine chest needs Aloe Vera. This ancient herb has been used for thousands of years by families around the world and it is safe and soothing for the inside and the outside of the body from toddlers to teens. Posted on March 27, 2015 by Aloe Life International Inc.